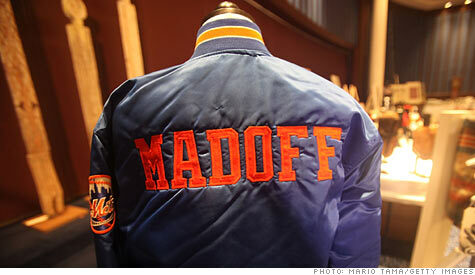 NEW YORK (CNNMoney) -- The court-appointed trustee in the Bernard Madoff Ponzi case has accused the owners of the New York Mets baseball team of reaping $300 million in profit from the scheme, according to documents unsealed Friday. Irving Picard, the trustee appointed by a federal bankruptcy court, also said Mets' owners Fred Wilpon and Saul Katz were aware of doubts involving the nature of Madoff's activities years before Madoff was arrested in December 2008. Picard also said Sterling Equities, the Wilpon and Katz family business, used funds from Madoff investments to operate its activities, which include the baseball team and real estate. In the suit, Picard is seeking the $300 million in alleged profit as well as a to-be-determined share of the hundreds of millions in principal that Sterling invested with Madoff. "Attempts to negotiate with the Sterling defendants have not resulted in a resolution of the amount owed to the Madoff Customer Fund," said David Sheehan, a counsel for Picard, in a press release. "We believe that the Sterling defendants received substantial funds -- in the hundreds of millions of dollars -- illegally through their [Madoff] accounts and we seek these recoveries for ultimate distribution to [Madoff] customers with valid claims." The trustee did not return an e-mail seeking further information about the amount in principal invested by Sterling. The owners of the Mets released a statement Friday that bashed the lawsuit as a "strong arm effort" and "flagrant abuse of the trustee's authority." They again denied that they knew anything about Madoff's scheme until he was arrested. "The conclusions in the complaint are not supported by the facts," said a prepared statement from Wilpon and Katz. "While they may make for good headlines, they are abusive, unfair and untrue." "We should not be made victims twice over - the first time by Madoff, and again by the trustee's actions," the statement added. Picard is in charge of recovering assets lost to Madoff's scheme and returning them to the thousands of victims. He has sued hundreds of investors who withdrew more than they put into Madoff's investment firm, which was really just a front for a Ponzi scheme. Many of these investors claim that they did not know Madoff's firm was a Ponzi scam. Many of these investors also say they were wiped out by the scam. Dozens of individuals are targeted in the lawsuit, many of them from the Wilpon and Katz families. Fernando A. Bohorquez, a lawyer with the trustee, specifically mentioned Wilpon and Katz, Wilpon's brother-in-law and chief operating officer of Sterling, as culpable. "There are thousands of victims of Bernard Madoff's massive Ponzi scheme," said Bohorquez, in a press release. "Saul Katz is not one of them. Neither is Fred Wilpon. And neither are the rest of the Sterling Equities' partners." Bohorquez said they were among the "largest beneficiaries of Madoff's fraud, reaping hundreds of millions in fictitious profits over Sterling's quarter-century relationship with Madoff." The owners announced on Jan. 28 that they were seeking a minority owner for the baseball team, in an apparent bid for financial support in the wake of the lawsuit. The lawsuit was originally filed on Dec. 7, 2010, but was under seal.